Workers hook up milking hoses to cattle on the turntable. arlier today, Chilliwack Cattle Sales —the largest dairy factory farm in Canada, as well as one of its owners were convicted of violating the BC Prevention of Cruelty to Animals Act. The company and its owner now face the maximum monetary penalty allowable by law – fines of $75,000 per count, as well as a victim surcharge. The factory farm pled guilty to three counts of animal cruelty. One of its owners, Wesley Kooyman, pled guilty to one count of animal cruelty. Wesley Kooyman also faces a prohibition on owning animals and having any control over the factory farm for one year. We anticipate the terms of sentencing will be formally announced by the court later this afternoon. Mercy For Animals urges the Chilliwack Law Court to sentence these animal abusers to the fullest extent of the law. Seven workers were also charged with animal cruelty. Their cases are still pending. This investigation prompted BC agricultural minister Norm Letnick to amend the BC Prevention of Cruelty to Animals Act to incorporate the Dairy Code of Practice. The Dairy Code of Practice outlines minimum guidelines concerning the treatment and welfare of Canada's dairy cows. According to reports obtained this year through freedom of information requests, the BC Milk Marketing Board found that more than 25 percent of BC dairy farms failed to comply with the provincial Code of Practice for animal welfare over an 18-month period. Inspection reports showed numerous problems, including overcrowding, lame or soiled cattle, tails accidentally torn off by machinery, branding and dehorning of calves without pain medication, cows lying on concrete, and failure to produce a manual outlining management practices on individual farms. Mercy For Animals is calling on all provinces to give the Dairy Code of Practice the force of law in their provincial animal cruelty legislation. Giving the code the force of law will make these important animal welfare guidelines requirements and help ensure that dairy cows receive a basic level of care and humane handling. 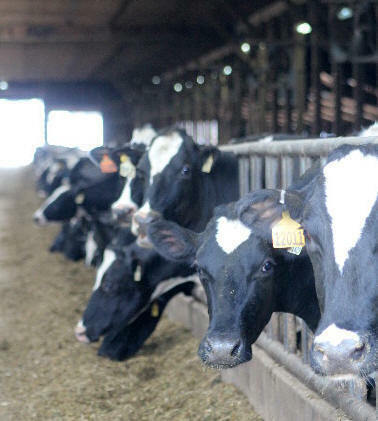 "It is obvious the dairy industry is incapable of self-regulation," said Mercy For Animals' president, Nathan Runkle. "We need stronger laws and more oversight to protect farmed animals from needless cruelty and violence. Giving the Dairy Code of Practice the force of law in every province would be a much-needed first step toward ensuring the sadistic animal abuse we uncovered in Chilliwack never happens again."